a cutaneous condition with retention of sweat, which is extravasated at different levels in the skin. Treatment is directed at reducing sweating by reducing the external heat load and avoiding irritating agents and tight clothing. Bland powders may be helpful. Called also prickly heat and heat rash. An eruption of minute vesicles and papules due to retention of fluid at the orifices of sweat glands. /mi·li·a·ria/ (mil″e-ar´e-ah) a cutaneous condition with retention of sweat, which is extravasated at different levels in the skin; when used alone, it refers to miliaria rubra. miliaria ru´bra heat rash; prickly heat; a condition due to obstruction of the ducts of the sweat glands; the sweat escapes into the epidermis, producing pruritic red papulovesicles. 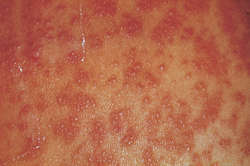 minute vesicles and papules, often with surrounding erythema, caused by occlusion of sweat ducts during times of exposure to heat and high humidity. Backup pressure may cause sweat to escape into adjacent tissue, producing itching and prickling. Prevention and treatment include cool environment, ventilation, colloidal baths, and dusting powders. Also called prickly heat. See also heat rash. A condition characterised by multiple vesicles associated with increased heat, moisture and occlusion. Prickly heat Dermatology A condition characterized by multiple vesicles associated with ↑ heat, moisture, occlusion Clinical Pruritus, hypohidrosis may cause irritability and insomnia. Cf Diaper dermatitis. Synonym(s): miliary fever (2) . A prickling skin eruption caused by blockage of sweat gland ducts and due to excessive sweating, especially in unacclimatized people in the tropics. Also known as prickly heat.